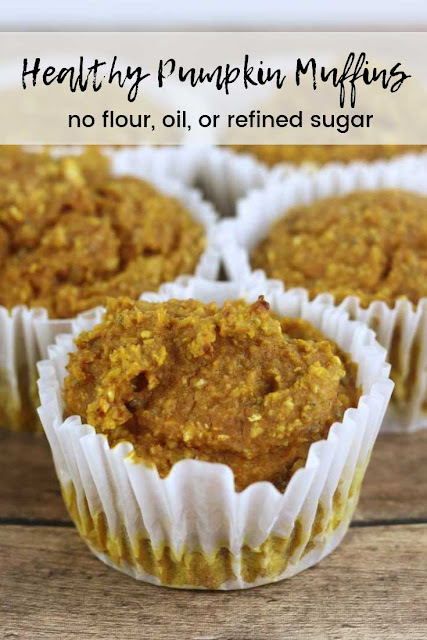 Enjoy the flavors of fall with these healthy pumpkin muffins made without flour, oil, or refined sugar. I'm an autism mom, and picky eating is common in kids with autism. When my kids were little, I made their baby food, and they didn't have salt or sugar so they would accept more foods. For a few years, I was feeling rather good because my oldest ate broccoli like other kids ate potato chips. Then he turned three. When he was three, he would only eat nuggets, fries, pancakes, and peanut butter and jelly. When I say that was all that ate, I mean that was literally all that he ate. With help from an SLP and OT, we got him eating seven foods by the time he was 8-years-old. One thing that he would eat was bread. I quickly learned how to hide veggies and other healthy things—like chia seeds and wheat germ—in the bread. I would shred carrots and other veggies to hide in the breads because it was the only way to sneak any vegetables besides ketchup in him. 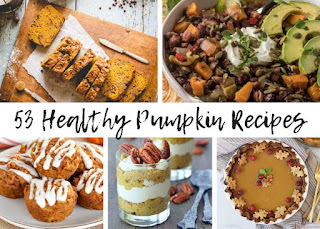 Those days taught me how to make delicious healthier versions of foods. 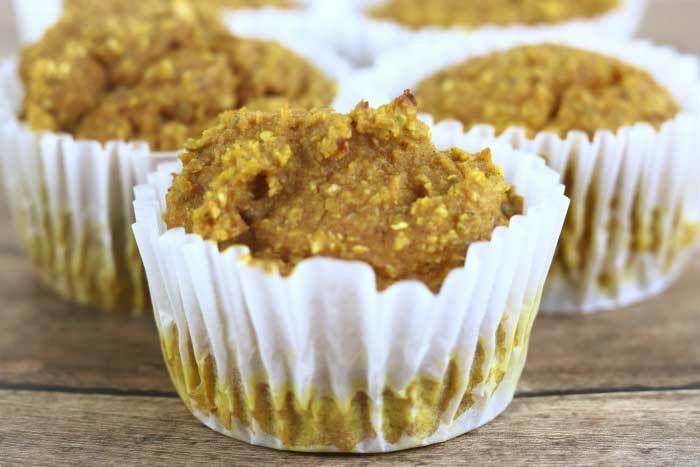 These healthy pumpkin muffins don't have flour, oil, or refined sugar, but they still taste great. 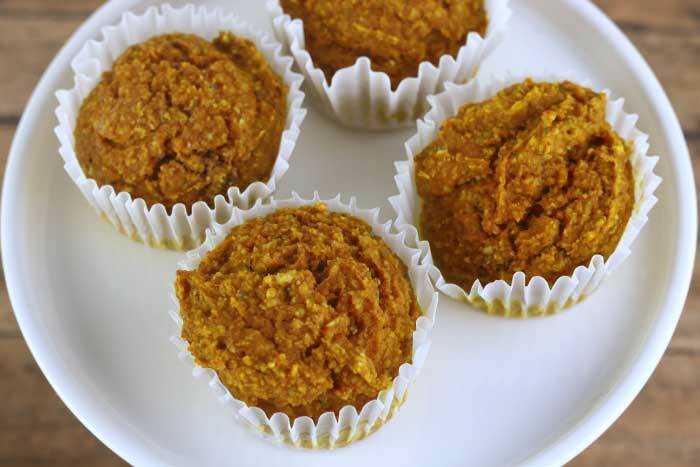 This flourless pumpkin muffins are delicious, but they don't have the texture of regular muffins. Since there's no flour, they don't raise and get fluffy. They aren't dense, but they aren't light and fluffy either. When I have to substitute for refined white sugar, my first choice is coconut sugar. Coconut sugar is sometimes called coconut palm sugar, so you might see that on the label when you're shopping. Coconut sugar is made by collecting the liquid sap from the coconut plant. The sap is heated until the water evaporates, leaving behind a brown granular sugar substitute. Coconut sugar has 30 calories per two teaspoons, which is the same as brown sugar. White sugar has 32 calories per two teaspoons. A 2 calorie difference per two teaspoons isn't significant, but coconut sugar has some benefits over white sugar. White sugar has no nutritional value. Coconut sugar retains some nutritional value, including the minerals zinc, iron, potassium, and calcium. It also has some antioxidants and short-chain fatty acids. Coconut sugar also contains a fiber called inulin. Inulin may be able to slow the absorption of glucose in the body, which could explain why it has a lower glycemic index than does table sugar. This doesn't mean that coconut sugar is considered healthy. It does still have calories, and it does still contain fructose. I feel that it's a better choice over table sugar, but it still needs to be eaten in moderation. Greek yogurt is higher in protein and lower in carbs than regular yogurt, so that's why I used it. You can also use regular unflavored yogurt if you want. I've been making my own unsweetened yogurt in my Instant Pot. I normally use that, but I only make it once every few weeks because I'm the only one who eats it in my family. Yogurt is a great ingredient for muffins because it makes them moist. 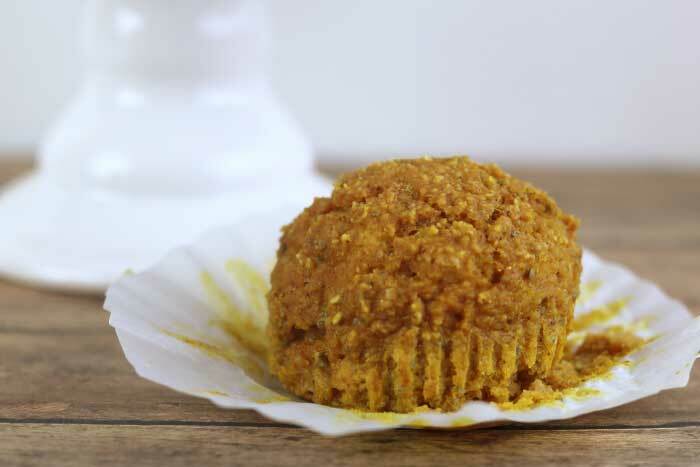 The tangy flavor gives the muffins a slightly tangy flavor that complements the sweetness. 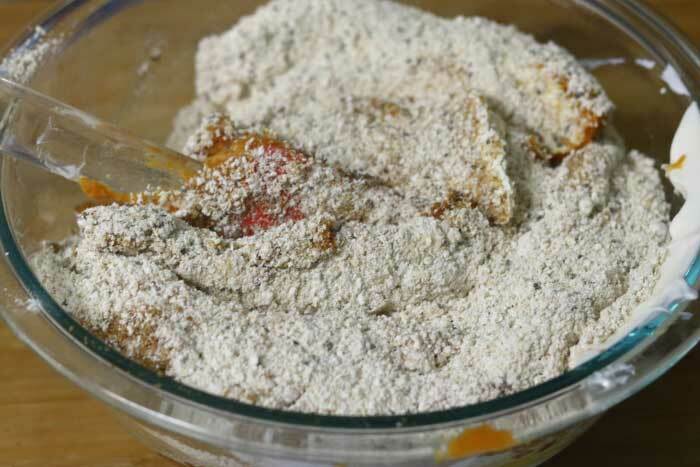 The acid in yogurt also reacts with the baking soda to make the muffins lighter and fluffier. Again, these muffins aren't as light and fluffy as traditional muffins, so just keep that mind as you make them. I added chia seeds for their health benefits. I only added a tablespoon, so you can't really taste them. Like I said, I'm good at sneaking extra nutrition into foods. 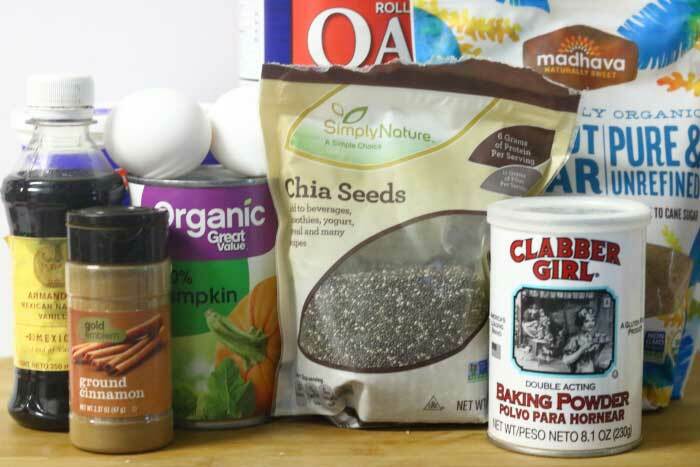 Chia seeds are high in omega-3 fatty acids and antioxidants. They also provide calcium, iron, and fiber. 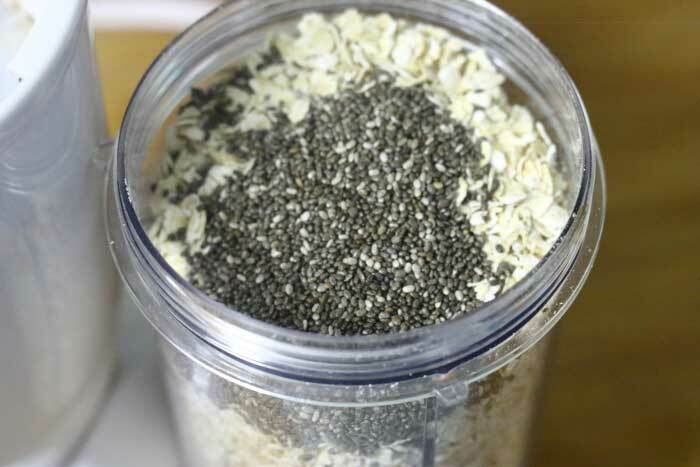 Process the oats and chia seeds, if you're using them, in a food processor or blender. I used a bullet style blender. Combine all ingredients in a medium to large bowl. Mix very well. I mixed by hand, but you could use a hand mixer. 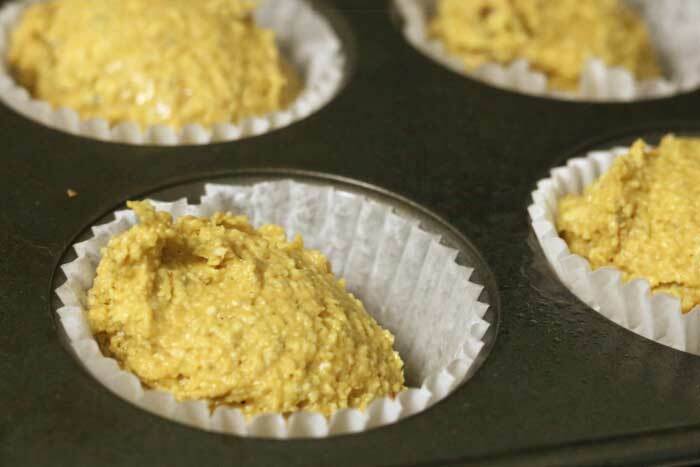 Since there isn't any fat in this recipe, the muffins will stick to the pan or liners. I used liners and sprayed them with olive oil. Divide the batter between 12 cupcake liners. This recipe raise, so you can fill the nearly full. I used an ice cream scoop and then added a little extra to a few of the tins to use all of the batter. Bake 15-18 minutes at 400 degrees. Let cool before eating. 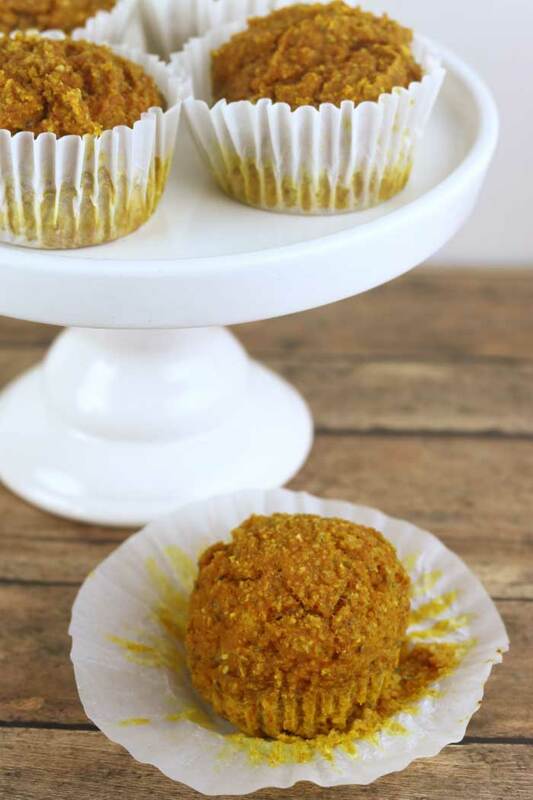 Since these pumpkin muffins really hold their shape, I think they would be really cute in a shaped muffin tin. Just be sure to spray with oil before you fill it.